During the past 30 years, I’ve published more of these recipes than anyone I know,” she laughs over the phone. Her voice is fervent, as if she were burbling about a new lover rather than the real source of her excitement: beef stew. The she in question is none other than Paula Wolfert, the queen of slow cooking and author of seven books, including 2004’s highly lauded The Slow Mediterranean Kitchen and the recent revision of her classic The Cooking of Southwest France. This particular beef stew, and the topic of today’s discourse, is daube. For the uninitiated, daubes are wine-based stews made from almost anything — from beef and goat to fish and octopus — that are cooked slowly in a tightly sealed pot for a long time. That’s all fine and good, I tell her, but what do the rest of us do, who, unlike her, haven’t trekked the Hautes-Alpes in southeastern France, for the real deal? “Le Creuset will work,” she reluctantly concedes. Then she brightens: “But there’s a trick in every recipe.” She goes on to explain that if you wet a circle of parchment paper and place it on top of the beef, it simulates a real daubière by reducing evaporation, making for a richer daube. She warns cooks to plan ahead because daubes are best eaten the next day, or the day after that. “It’s great to make on a Sunday,” she says, “and to eat the rest of the week.” In Avignon, where Wolfert conducted research for some of her books, traditional lamb daubes are reheated a number of times before serving. “It’s the only way to bring out all the flavors,” she insists. Suddenly her part standup routine, part culinary stream of consciousness stops. Authentic Languedoc cassoulet is calling, which, she assures me, she finds as fascinating as daube. Somehow I don’t doubt her. – I use tomato pureé for my daubes. It imparts a better colour and has no sign of the slight sourness of canned tomatoes. – Can hot spices be used? I know that the French are not familiar with hot food, but a drop of “jalapeño” sauce or even Tabasco may fit well. – Also, French don’t use rice, and here we prefer daube with rice rather than pasta. Well, abraços e parabéns pelo site. Serio, obrigado por não ter escrito em Português. Acho que é difícil dar boas respostas em Português. Eu tenho que usar todos os tradutores on-line para me ajudar! 1. You could, yes, indeed. But parchment is so easy. 3. You certainly can use hot spices, but you will then not have a daub but more of carne assada or, if you use a lot of hot sauces, even something approaching a vindaloo. 4. Again, personal preference. 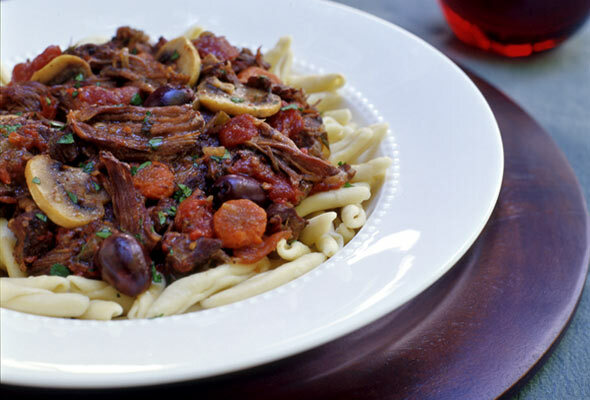 I like to have a daube on homemade egg noodles or on a big plate of puré de batatas! I was born in the heart of Provence and my first culinary memories are of my grandmother cooking Daube in a century old dutch oven and I wish I could back you up and say this recipe is authentic but alas, it’s not. Tomato in Daube is a cardinal sin, as it is in Bourguignon. And I have never heard of olives either. Aubagne, by the way is nowhere near the Alpes, basses or hautes ;) but a very small town niched near Marseille. Fluff, thanks for writing. I will have to stand by what Paula says, as she spent much of her life in the region researching and studying. Her recipes are all from local cooks, so it’s authentic to them and their families. As far as the Aubagne, that is all my doing! I’ve made a fix.